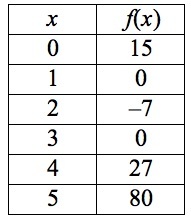 The table above shows some values of the polynomial function . Which of the following is a factor of ? Register or Log in to track your accuracy. You have correctly answered 60.5% of the questions you've attempted.